Activation Vodafone for JAF allows to activate your Pkey to support Vodafone/Huawei U120s, U120, V810, V715, U120e, U121, V716, U401i, V720, V725 , V712 v.2 phones. After activaiton you can unlockm read user code and reset counter on above phones. Information: You need USB cable for support above phones - cables can be foudn at our store. Dejan TRK credits for JAF are service dedicated for all users who own only JAF® Box interface (Pkey no needed here) allows to unlock leatest BB5 phones using only Fbus cables in few seconds. Diffrence beetwen MT-BOX SL2 credits it's that TRK Dejan for JAF® unlock also N96. You can unlock such phones as E63, 5800, 5320, N96, N95 8Gb, E51, 6220c and others. 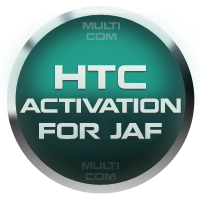 HTC Activaction for JAF® allows to reading codes for unlocking HTC phone witout logs and limits. You must be connected to the Internet and software Customer Care version 0.80 and higher. 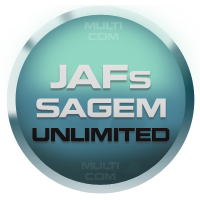 JAFs UNLIMITED - 10 credits allows you to unlock unlimited Sagem/Vodafone phones using original Pkey. You don't need any credits - you can unlock even 1 million of phones. When you buy this feature you will recive 10 credits to yoru JAFs account - then you can use them for PREMIUM activaiton that will reset your limit to 0 and give you unlimited option.